Hello Beauties, Now i know that when we think of Green Tea its not the drink that everyone will jump too. However, it is surprisingly filled with such healthy properties we would be foolish to turn it down. Green Tea is more than just a funny coloured tea, it contains so many important nutrients to help your body. It is full of polyphenols like flavonoids and catchins which are a powerful antioxidant reducing the free radicals in our body. Free radicals are shown to help reduce the ageing process and protects against diseases. One powerful antioxidant which can be found in Green Tea is Epigallocatechin Gallate, which is often used to treat some diseases. 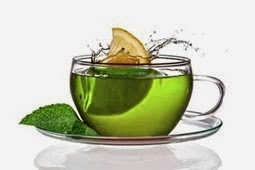 Yes that is right Green Tea will help you shed those unwanted pounds, and if you look into those fat burning supplements chances are you will find Green Tea in there. This is because Green Tea increases your metabolic rate, and Caffeine has been shown to mobilising fatty acids from the fat tissues so you are able to use them as energy. Yes i know this sounds crazy but it is true. The low amount of caffeine that is in Green Tea has been proved to act as a stimulant. The caffeine block an inhibitory neurotransmitter called Adenosine increasing the firing neurone and concentrations of dopamine and norepinephrine. It has also been proven to improve your mood, reaction time and memory. Breast Cancer: Women who drank the most Green Tea had a 22% lower risk of developing breast cancer. Prostate cancer: Men drinking Green Tea had a 48% lower risk of developing prostate cancer. Do you drink Green Tea, What do you think?